Congratulations to Stewart Scott, Champion of the 2009 Aussie Millions Main Event (AU$2,000,000)! Stewart Scott - Champion of the 2009 Aussie Millions Main Event! At the start of play on Day 1a, Joe Hachem threw down the challenge gauntlet to all of his countrymen that entered this tournament. "I think it's about time an Aussie took home the title," said Hachem. "Get your acts together!" Stewart Scott must have taken that to heart. He hung around in the middle of the pack for the first three days of this tournament, using the best of his survival skills. In the last two days, when it was time to make a strong push, he rampaged through the field to take home the title of 2009 Aussie Millions Main Event champion. After the final, life-changing hand, Scott scooped up all of the cash on the table and let it fall through his fingers. "Yeah!" he shouted. His wife was let onto the set. Scott picked her up in a long embrace, spun her through the air, and gave her a deep kiss. A few minutes later Scott was presented with the winner's trophy, bracelet, and giant cardboard check. He was asked what it meant to be the first Aussie to win the Aussie Millions Main Event. "It makes it a lot sweeter," he said. "It's nice to bring one home for the team." Congratulations to Stewart Scott and all Aussies for finally bringing home the Aussie Millions Main Event title. That concludes our coverage of the 2009 Aussie Millions Main Event, but things aren't finished in Melbourne just yet. Tomorrow afternoon we'll be bringing you coverage of the highly anticipated AU$1,000,000 buy-in cash game. It should be an amazing game -- you won't want to miss it! 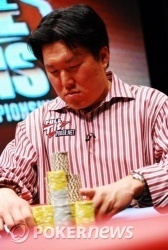 Peter Rho Eliminated in 2nd Place (AU$1,000,000); Stewart Scott Wins the 2009 Aussie Millions Main Event! Stewart Scott has the button. He makes it 250,000. Peter Rho goes into the tank. After a minute, he announces reraise and moves all in for 2.175 million total. Scott double-fist-pump-snap calls with ! "Come on! One time!" Scott shouts. Rho turns over , just about the worst hand he could have against pocket aces. The flop comes out -- it's no help to Rho. Scott is ecstatic. He shouts, "YEEEESSSS!" and pumps his fist through the air. Rho needs runners or he's out. The turn is the . It's over! Scott jumps in the air, shouts "YEEEEEEES!" and hugs Rho. The two men shake hands. Rho seems understandably disappointed, but second place in this tournament is nothing to sneeze at. The dealer burns and turns the last card for posterity. It's the . Peter Rho is eliminated in second place, earning AU$1,000,000 for the privilege. 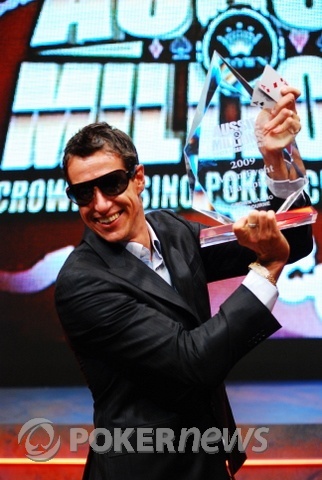 And with that, the 2009 Aussie Millions Main Event comes to an end. Peter Rho has the button. He calls and Stewart Scott checks. The flop is and Scott checks it over to Rho who checks behind. The falls on the turn and both players check. The hits the river and Scott checks to Rho who bets 150,000. Scott folds and Rho wins the hand. Stewart Scott has the button. He raises to 250,000 and wins the pot. Peter Rho has the button. He raises to 275,000 and Stewart Scott calls. The flop comes and Scott checks. Rho bets 300,000 and its enough to get Scott to lay his hand down. Stewart Scott has the button. He raises to 250,000 and takes the blinds. It was a limped pot preflop. Peter Rho bet 150,000 on the flop and was called by Stewart Scott. Both players checked the turn. On the river, Scott took the pot down with a bet. Stewart Scott has the button. Peter Rho gets a walk. Peter Rho has the button. He gives Stewart Scott a walk.